The Center for Popular Democracy (CPD), the National Immigration Law Center (NILC), and the Vera Institute of Justice (Vera) work together to expand the national movement for publicly funded universal representation. CPD and NILC provide strategic support to local and state advocacy campaigns. In 2017, Vera launched the Safety and Fairness for Everyone (SAFE) Network in partnership with a diverse group of local jurisdictions, all dedicated to providing publicly funded representation for people facing deportation. Through the SAFE Network, Vera provides strategic support to government partners, legal service providers, and advocates. Collectively, CPD, NILC, and Vera also coordinate at a national level, creating resources and space for advocates advancing universal representation to share, strategize, and learn from one another. 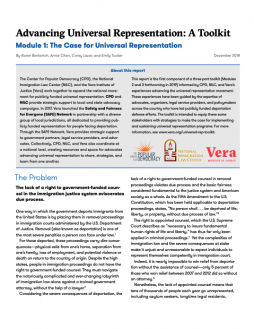 This report is the first component of a three-part toolkit (Modules 2 and 3 forthcoming in 2019) informed by CPD, NILC, and Vera’s experiences advancing the universal representation movement. These experiences have been guided by the expertise of advocates, organizers, legal service providers, and policymakers across the country who have led publicly funded deportation defense efforts. The toolkit is intended to equip these same stakeholders with strategies to make the case for implementing and sustaining universal representation programs. For more information, see www.vera.org/universal-rep-toolkit.